Brussels (French: Bruxelles, pronounced [bʁysɛl]; Dutch: Brussel, pronounced [ˈbrɵsəɫ]), the largest city in Belgium, is also that nation's capital city and its administrative, commercial, and financial center, as well as the administrative heart of the European Union (EU). All services and institutions of national importance are based in the city. Today, the settlement of Brussels is effectively most often synonymous with the more recently established Brussels-Capital Region, which is one of Belgium's three regions. Brussels has grown from a seventh century chapel into a metropolis of over one million inhabitants. The city’s colorful past is on display in the architectural gems of the medieval market known as the Grand Place, including the curious Manneken Pis urinating sculpture, in numerous churches, in the city’s 100 museums, and celebrated with the annual Ommegang parade featuring giant puppets, and scores of folkloric groups, dressed in medieval garb. A major tourist destination and cultural attraction—visual arts, film, music, literature, and theater institutions abound. Since the end of World War II the city has taken an international role, becoming the headquarters of NATO and the European Communities (now the European Union). 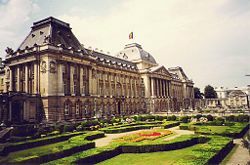 The City of Brussels in the Brussels-Capital Region is the capital of a nation divided along linguistic lines, resulting in a cultural divide as well. 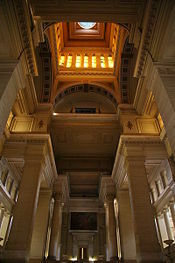 Compounding those difficulties, the public institutions in Brussels offer a bewildering complexity—with a regional parliament, a council and a board, a Common Community Commission, Flemish and French community commissions, 19 local municipal authorities, six inter-municipal policing zones, as well as national and international governmental bodies. The name Brussels comes from the old Dutch Bruocsella, which means marsh (bruoc) and home (sella) or "home in the marsh." Brussels is located in the central plateau of Belgium, in the north-south oriented valley of the Zenne (or Senne) River, a small indirect tributary of the Scheldt, and spreading east and west over undulating plateaus separated by the tributaries of the Zenne. Close to the North Sea, Brussels has a mild, moderate climate, with summer temperatures usually between 68°F and 77°F (20°C and 25°C), and winter temperatures rarely below 32°F (0°C). There are approximately 200 days of rain per year, with a total annual precipitation of 25.1 inches (637 mm). The land area of Brussels totals 62.5 square miles (162 square kilometers). 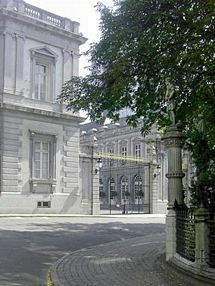 In the center of Brussels, the Zenne was covered up and boulevards were built over top in the nineteenth and early twentieth centuries, although it remains visible in the outskirts of Brussels. The Zenne was notorious for being one of Belgium's worst polluted rivers, since all effluents from the Brussels Capital Region went into it without treatment. This problem was solved in March 2007 with the completion of new sewage treatment plants. The city center is enclosed by an inner ring road, which follows the course of the medieval city fortifications. The Upper Town has the city's grand museums and is where the main government buildings are located. The Lower Town has the city’s medieval heart, including the Grand Place medieval market, as well the commercial quarter. A 1555 map of the city. Brussels was first mentioned when Bishop Saint-Gery of Cambrai settled a chapel on a small island there around 695 C.E. Saint Vindicianus, also a bishop of Cambrai, is said to have died in the neighborhood of Brussels. The founding of Brussels is usually situated around 979, because Charles, Duke of Lower Lotharingia (953–993), transferred the relics of Saint Gudula from Moorsel to the Saint Gery chapel in Brussels. The Holy Roman Emperor Otto II gave the duchy of Lower Lotharingia to Charles, the banished son of King Louis IV of France in 977. Charles built the first permanent fortification in the city, doing so on that same island. The founding of the county of Brussels was attributed to Lambert I of Leuven, count of Leuven around 1000. 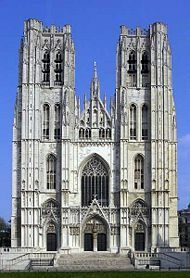 In 1047, his son Lambert II of Leuven founded the Saint Gudula religious chapter. In the twelfth century the small town became an important stop on the trade route from Bruges (Brugge) and Ghent to Cologne. The village benefited from this favorable position and, as it grew to a population of around 30,000, the surrounding marshes were drained to allow for further expansion. The Counts of Leuven became Dukes of Brabant at about this time (around 1184). Brussels became one of the main towns of the duchy of Brabant. The manufacture of luxury fabrics that were exported to Paris, Venice and other towns, became the main source of wealth, enriching a few merchant families who gained the right to exercise power as magistrates. The Count of Flanders invaded and briefly occupied Brussels. 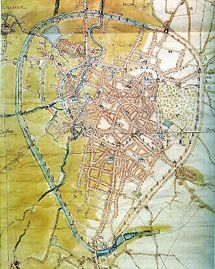 After Flemish troops left, from 1357 to 1379, a new city wall was constructed: The inner ring, or "pentagon" now follows its course. By 1430, after the wedding of heiress Margaret III of Flanders with Philip the Bold, Duke of Burgundy in 1369, the duke of Burgundy gained control of the duchy of Brabant. Brussels became the princely capital of the prosperous Low Countries, and flourished. Artists, including Rogier van der Weyden (1400–1464), and craftsmen, produced paintings, wooden sculptures, large historical tapestries, plate, jewelry, that were exported from Brussels. At this time the Town Hall, with its tall steeple, various Gothic churches and cathedrals, and the impressive Coudenberg Palace, were built. Charles V (1500-1558) was declared King of the unified Spain, in 1516, in the Cathedral of Saint Gudule in Brussels. After a prolonged political crisis, it was in the Coudenberg Palace that Charles V abdicated in 1555. At that time, the city’s population grew to nearly 50,000. The Willebroek canal, linking Brussels with the port of Antwerp, was dug in 1561. The first two Low Countries Protestant martyrs died at the stake in Brussels in 1523, the first of many. Calvinists ruled the city from 1578 until 1585, during the Revolt of the Netherlands (Eighty Years’ War) from 1568-1648. Fine Italo-Flemish Baroque churches were built there during the reign of Archduke Albert and Isabella (1598–1633). Grand Place after the 1695 bombardment by the French army. In 1695, Brussels was attacked by troops of King Louis XIV of France, one of a series of invasions. 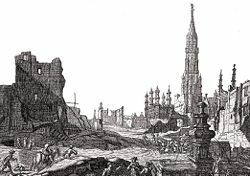 A bombardment destroyed the city's heart: More than 4000 houses were set on fire, including the medieval buildings on the Grand Place. New guildhalls, the existing architectural landmarks surrounding the Grand Place, were built after this destruction. French troops occupied Brussels from 1746 to 1748, although the city revived with an economic upturn in the late eighteenth century. The Place Royale and Brussels Park was built at this time, as was much of the upper town. In 1789, a popular revolt broke out in the Austrian Netherlands, in reaction against the centralizing policies of Emperor Joseph II (1741-1790). French republican troops invaded, annexing Belgian principalities to France. Brussels became a chief town of a French département. After Napoleon was defeated at Waterloo, in present-day Belgium, on June 18, 1815, the victorious powers at the Congress of Vienna created the United Kingdom of the Netherlands, which was to serve as a buffer state against any future French invasions. Brussels shared the status of capital with The Hague. The Belgian Revolution began with a riot in Brussels in August 1830 and led to the establishment of an independent, Roman Catholic and neutral Belgium, with Brussels as its capital. Under Leopold II, who ascended the throne on July 21, 1831, the city walls were replaced by tree-lined boulevards, the Zenne was culverted (as it brought diseases), the Brussels-Charleroi canal was dug, and the Tervuren Avenue was laid out. During the First World War, Germans occupied Belgium from August 1914 to November 1918. The mayor of Brussels, Adolphe Max (1869-1939), became famous for resisting abuses at the hands of German forces. After the war, non-payment of reparations from Germany harmed the Belgium economy, as did soaring exchange rates, which generated a serious flight of capital, an imbalance of payments, and rampant inflation. 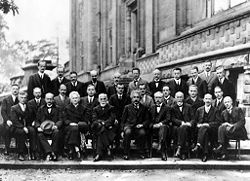 Brussels hosted the famous fifth Solvay Conference in 1927, where physicists including Albert Einstein, Planck, Curie, Lorentz, Dirac, De Broglie, Bohr, Schrödinger, Pauli, and Heisenberg discussed the path of the modern physics, specifically the new Quantum Theory. Greater Brussels became officially bilingual in 1932. A world fair took place in Brussels in 1935. During World War II, the German army bombed Brussels from May 10, 1940, and took control of the city on May 18. The Nazis appointed a governing council headed by pro-Nazi Flemish nationalist Jan Grauls, and sought to divide Belgium by backing Flemish autonomy supporters. British troops liberated Brussels on September 3, 1944. Most of the war damage to the city was done from 1944 to 1945. Huge Flemish protests against “Frenchification” took place in Brussels in 1961 and 1962. Flemings demanded bilingualism in the public services and opposed the expansion of the French-speaking urban area into surrounding Flemish areas. Legislation was passed in 1963 limiting the capital to 19 bilingual municipalities. The Francophone Democratic Front appeared in 1964, to resist perceived Flemish interference in Brussels municipal affairs. 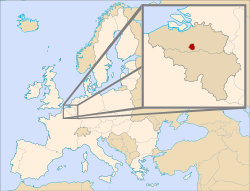 A constitutional reform enacted on December 24, 1970, created a Flemish region, a Walloon region, and the Brussels region. The parliament gave cultural autonomy to the Flemish and Walloon regions in 1971, and the constitution was revised in 1980 to create an independent administration within each region, extended from 1988 to 1989, to cover the economy and education. On May 29, 1985, at the final of the 1985 European Cup tournament, football hooligans caused the collapse of a retaining wall at the Heysel Stadium in Brussels, killing 39 people. Saint Michael and Gudula's Cathedral. The Church of the Chapel at Brussels, drawing by Léon van Dievoet. One of the European Parliament buildings. 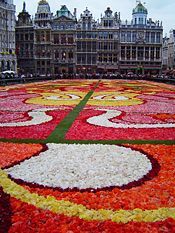 Although the City of Brussels, a smaller municipality within the capital region, is the official capital of Belgium, Brussels-Capital Region is the de facto capital. 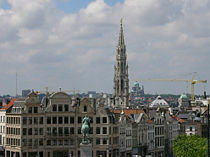 Brussels is also the capital of both the French Community of Belgium and of Flanders. The Brussels-Capital Region is divided into 19 municipalities, of which the City of Brussels is the largest and most populous. A regional parliament of 89 members (72 French-speaking, 17 Dutch-speaking, parties are organized on a linguistic basis), plus a regional government, consisting of an officially linguistically neutral, but in practice French-speaking minister-president, two French-speaking and two Dutch-speaking ministers, one Dutch-speaking secretary of state and two French-speaking secretaries of state. A council and a board, with the same membership as the organs of the Brussels Region. This is a decentralized administrative public body, assuming competences that elsewhere in Belgium are exercised by municipalities or provinces (fire brigade, waste disposal). The Common Community Commission, with a United Assembly (that is, the members of the regional parliament) and a United Board (the ministers of the region, with the minister-president not having the right to vote). This commission is responsible for implementing cultural policies, can give subsidies, enact by-laws, and ordinances in the field of welfare. The Flemish Community Commission for the Flemings in Brussels, and the French Community Commission, each with an assembly (that is, the members of parliament of the linguistic group) and a board (the ministers and secretaries of state of the linguistic group). Some legislative competencies of the French Community have been devolved to the French language Walloon Region, and to the French Community Commission (for the bilingual language area). The Flemish Community merged the Flemish Region into the Flemish Community. The Brussels Region is neither a province, nor does it belong to one. Within the region, 99 percent of the provincial competencies are assumed by the Brussels regional institutions. Remaining is only the governor of Brussels-Capital and some aides. Nineteen of the 72 French-speaking members of the Brussels Parliament are also members of the Parliament of the French Community of Belgium, and until 2004, this was also the case for six Dutch-speaking members, who were at the same time members of the Flemish Parliament. Now, people voting for a Flemish party have to vote separately for six directly elected members of the Flemish Parliament. Meanwhile, Brussels hosts two of the main institutions of the European Union—the European Commission and the Council of the European Union. The European Parliament, also has a parliamentary chamber in Brussels (the other plenary sessions are held in Strasbourg, and its administrative headquarters are in Luxembourg). Brussels is also the political seat of the North Atlantic Treaty Organization (NATO), the Western European Union (WEU) and EUROCONTROL, the European Organization for the Safety of Air Navigation. Due to this, some countries have three ambassadors present in Brussels: the normal bi-lateral ambassador, the EU-ambassador, and finally the NATO-ambassador. 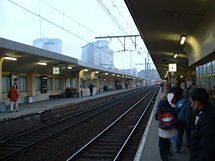 Platforms at Brussels North station. Brussels metro (actually here premetro), de Brouckère station. The postwar boom years, enhanced by the establishment of the European Union and NATO headquarters in Brussels, contributed to the rapid expansion of light industry throughout most of Flanders, particularly along a corridor stretching between Brussels and Antwerp (now the third-largest port in Europe after Rotterdam and Hamburg), where a major concentration of petrochemical industries developed. Being the de facto European capital, the economy of Brussels is heavily dominated by regional headquarters of multinationals, by European institutions, by the still heavily (over)populated Belgian administrations, and by related services. Brussels also has more commuters coming mainly from Flanders, closely followed by commuters from Wallonia (and far smaller numbers of commuters from the Netherlands and France), than local employment. Within Brussels, the unemployment rate is higher than in the other Belgian regions (above 20 percent in 2008). This is because of: Higher taxation rates, a high percentage of mono-lingual French-speakers, a mismatch between education and labor market needs, a high percentage of immigrants with a low education level, and local political institutions showing sub-standard performance. Brussels is served by Brussels Airport, located in the nearby Flemish municipality of Zaventem, and by the much smaller Brussels South Airport, located near Charleroi (Wallonia), some 30 miles (50km) from Brussels. Brussels is also served by direct high-speed rail links: to the United Kingdom by the Eurostar train via the Channel Tunnel; to Amsterdam, Paris and Cologne by the Thalys; and to Cologne and Frankfurt by the German ICE. 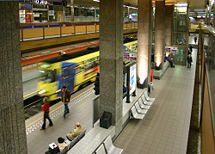 The Brussels metro dates to 1976, but underground lines known as premetro have been serviced by tramways since 1968. A comprehensive bus and tram network also covers the city. Brussels also has its own port on the Willebroek canal located in the northwest of the city. Since 2003, Brussels has had a car-sharing service and local ridesharing company taxi stop. In 2006, shared bicycles were introduced. The ancient pattern of streets radiating from the Grote Markt/Grand'Place in large part remains, but has been overlaid by boulevards built over the River Zenne, and the city walls. Brussels is the hub of the fan of old national roads. Usually named steenwegen/chaussées, these highways normally run straight as a die, but on occasion lose themselves in a labyrinth of narrow shopping streets. The city center, sometimes known as "the pentagon," is surrounded by the "small ring," a sequence of boulevards built upon the site of the second set of city walls. The Brussels capital region had a population of 1,031,215 in 2007, for 161.382 km² which gives a population density of 6238 inhabitants per square kilometer. The municipality had a population of about 140,000 in 2006. The metropolitan area had about 2,090,000 inhabitants. In January 2006, 73.1 percent of its registered inhabitants were Belgian nationals, 4.1 percent French nationals, 12 percent other EU nationals (usually expressing themselves in either French or English), 4 percent Moroccan nationals, and 6.8 percent other non-European Union nationals. Brussels lies just north of the “language boundary” that separates Flanders region in the north, where the Flemish variant of Dutch is spoken, from the French-speaking Walloon region in the south. Brussels is officially bilingual, French, and Dutch, although about 85 percent to 90 percent of the population are French-speakers (including migrants), and about 10 percent to 15 percent are Dutch-speakers. The historical indigenous language of Brussels were Brabantian dialects particular to Brussels and related to Dutch. During the nineteenth century however, as literacy progressed, most dialect-speakers turned to French rather than to Dutch as their language of culture. A linguistic curiosity is the "Marollien" dialect, based on the Walloon of Liège and heavily influenced by the general (Dutch) Brussels dialect, which was once spoken mostly in a central section of the city, the "Marolles/Marollen." Today, all Brussels dialects are on the verge of extinction, although there are some attempts at revival. There are several universities in Brussels. The two main universities are the Université Libre de Bruxelles, a French-speaking university with about 20,000 students in three campuses in the city (and two others outside), and the Vrije Universiteit Brussel, a Dutch-speaking university with about 10,000 students. Other universities include the Facultés Universitaires Saint Louis (FUSL), the Katholieke Universiteit Brussel (KUB) and the Royal Military Academy (RMA). 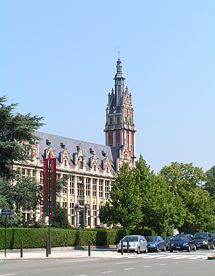 A satellite campus of the Université Catholique de Louvain, called CL-Brussels, which hosts the faculty of medicine, is located in Brussels. The Conservatoire Royal and the Koninklijk Conservatorium are drama schools in the city. Don Quijote & Sancho Panza statue at Place d’Espagne/Spanjeplein: Don Quijote. 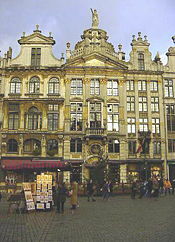 The Grand Place (Dutch: Grote Markt), the central market square, which has the Gothic Town Hall and the Baroque late seventeenth-century guildhouses with the sculptures of Peter van Dievoet surrounding the square. The Royal Museums of Fine Arts of Belgium combining four interconnected sections of old masters and modern art collections, which include works by Pieter Bruegel, Rubens, Paul Delvaux and René Magritte. On the site of the Heysel/Heizel are the Atomium, a remnant of the 1958 World Exposition in Brussels, and Mini-Europe, a park which hosts miniature models of famous European buildings. Brussels is famous for being home to many Belgian comics characters, including The Smurfs, Largo Winch, Tintin, and Lucky Luke to name a few. Throughout Brussels, (also nicknamed Comic City) there are many murals, frescos, and even statues celebrating the city's many cartoon heroes. Notable people from Brussels include: Actress Audrey Hepburn, painter René Magritte, jazz musician Toots Thielemans, actor "The Muscles from Brussels" Jean-Claude Van Damme, and painters Rogier van der Weyden(1400-1465) and Barend van Orley (1488-1541), among others. 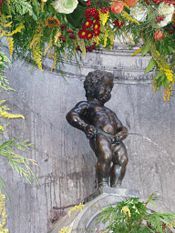 The Manneken Pis (Dutch for little man pee), is a Brussels landmark. It is a small bronze fountain sculpture depicting a naked little boy urinating into the fountain's basin. On many occasions the statue is dressed in a costume, which are changed—often accompanied by brass band music. The sculpture recalls a legend that in 1142, the troops of the two-year-old Duke Godfrey III of Leuven, while battling against the troops of the Berthouts, in Ransbeke (now Neder-over-Heembeek), put the infant lord in a basket and hung it in a tree, to encourage them. From there, he urinated on the troops of the Berthouts, who eventually lost the battle. An introduction to the Brussels dialect and way of life can be obtained at the House of Toone, a theater of marionettes that delivers slapstick comedy a stone's throw away from the Grand Place. The Ommegang (Dutch: Walking around), which started in the 14th-century as a religious procession, takes place every July, commemorating Charles V's Joyous Entry in the city in 1549. The colorful parade includes floats, traditional giant puppets, and scores of folkloric groups, either on foot or on horseback, dressed in medieval garb. The Meyboom (Dutch: Tree of May), which dates from 1308, in which a young beech tree is paraded with brusseleir songs and giant puppets, and planted, takes place annually on August 9. ↑ Brussels. City-Data.com. Retrieved March 20, 2012. ↑ Cheap flights to Brussels. Easyjet. Retrieved March 20, 2012. Brussels A Cultural and Literary History. Gardners Books, 2008. ISBN 9781904955474. Encyclopaedia Britannica Online. Brussels. Retrieved July 11, 2008. Jacobs, Roel. Brussels: A City in the Making. Brugge: Marc van de Wiele, 1994. ISBN 9789069660998. Plissart, Marie-Françoise, and Gilbert Fastenaekens. Change: Brussels, Capital of Europe. Brussels: Prisme, 2005. ISBN 9782960010381. This page was last modified on 6 July 2016, at 22:59.